Panhandle Kiwanis President Dave Eubanks and Secretary Elaine Espinosa proudly present a $500 check to Rosa A. Mettler, LCSW chief programs officer and Emily Aizawa fundraiser manager for Children's Village. 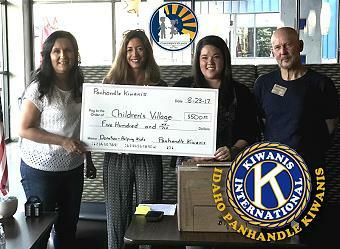 Panhandle Kiwanis is proud to support of the great works of Coeur d Alene's Children's Village. Children's Village is a residential home for children who are in need of a safe-haven from abuse, neglect, or severe family crisis. Our contribution will help Children's Village to provide care, including stability, safety, and love — 24 hours a day, 365 days a year for local children in need. 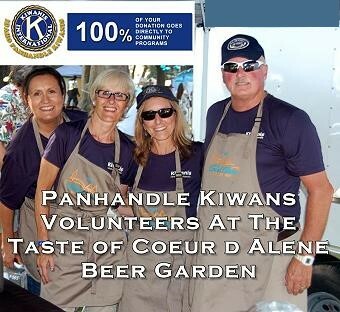 At the Coeur d' Alene City Park, on AUGUST 4 - 6, 2017, Panhandle Kiwanis sponsored our annual Taste of Coeur d Alene event. Over 100 artisans and food vendors participated in this fantastic money raiser. Pictured on the left represents just a few of our enthusiastic volunteers. These are just some of our outstanding community focused members and they are an important part of our great success. Special KUDOS go to this year's project lead Mary Jo Kringas and Vendor/Artisan Coordinator Kathy McDowell for their excellent efforts to bring this huge project together along with a fantastic group of strong, hard working volunteers. We featured excellent micro-brews in our Beer Garden and the on-stage entertainment for young and old was AMAZING. We're looking forward to growing this fun happening for 2018! 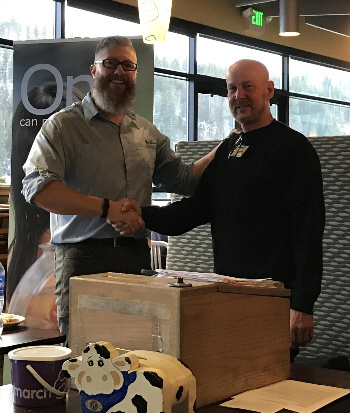 Our Panhandle Kiwanis guest speaker for Wednesday, February 15th was Geoff McLachlan - Professionals at Play. Great motivational message with fantastic energy is an inspiration to the group. 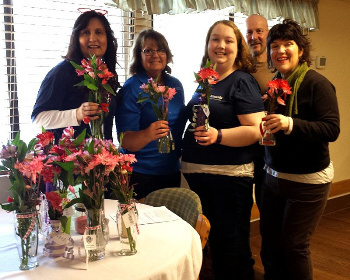 Left to right... Panhandle Kiwanis members Elaine Espinoza, Kathy McDowell, Michelle Mori, Dave Eubanks and Mary Jo Kringas helping local Seniors with an Intentional Random act of Kindness on Valentine's day. Panhandle Kiwanis is proud to recognize area teachers with the "Invest, Inspire and Innovate" Award. The hard work and commitment of these excellent educators makes us proud to be involved in this program.